Wake up with the 3 C's - Coffee, Conversation, and Connection. 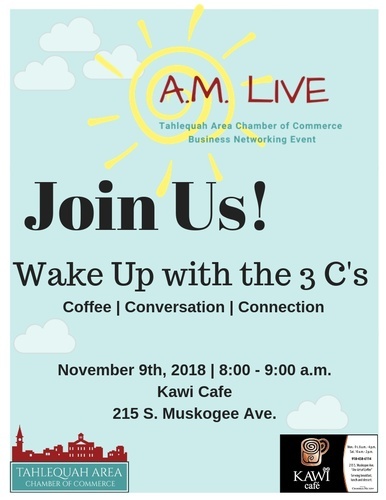 A.M. Live is a business networking event hosted by the Tahlequah Area Chamber of Commerce. This A.M. Live will take place on Friday, November 9th, from 8-9a.m. at Kawi Cafe. Kawi Cafe is located at 215 S. Muskogee Ave in Tahlequah.